For the last ten years, we've worked one-on-one with students from elementary school through graduate school. No matter their age, no matter the material, when you ask what they're struggling with, students almost universally name a subject: "math," "English" or, in some instances, "school." Doubting that all of school is the issue, we then ask to see their last test. After some grumbling, the student digs down, deep into the dark, dank recesses of his or her backpack, and pulls out a balled-up, lunch-stained paper that, once smoothed out, turns out to be the latest exam. To a teacher, this should be incredibly frustrating. You spend a huge part of your life grading tests, commenting on essays, and providing thoughtful feedback on homework assignments . . . only to have them wadded up and ignored. (Yes, students look at their tests, but you shouldn't harbor any illusion that they look at anything but the red letter grade.) Before writing students off for being ungrateful or lazy, you need to understand why what they're doing makes perfect sense. Telling students they need to take advantage of the feedback they get isn't just good advice -- it's established science. In the last few decades, researchers have discovered a lot about how people become experts. The main idea, made popular by everyone from author Malcolm Gladwell to rapper Macklemore, is the 10,000-hour rule. Ten thousand is the number of hours it takes to become an expert in almost any field. While it's wonderful that people are starting to understand how work leads to expertise, the most important part of that research is not how much practice someone needs to perform, but what kind of practice. This latter category is called deliberate practice and involves isolating what's not working and mastering the difficult area before moving on. Picture a classical violinist rehearsing. He or she would not play a new piece start-to-finish, fudging through tricky sections and trying to "be done." That musician stops in trouble spots, figures them out, and then plays that measure over and over again, and only moves on when it's perfect. The same principle applies to schoolwork. So why don't students view their mistakes as a valuable asset? Well, students don't think about their mistakes rationally -- they think about them emotionally. Mistakes make students feel stupid. "Stupid" is just that: a feeling. Specifically, it's the feeling of shame, and our natural response is to avoid its source. If we say something embarrassing, we hide our face. If we get a bad grade, we hide the test away. Unsurprisingly, that's the worst move to make if you ever want to get better. Academic success does not come from how smart or motivated students are. It comes from how they feel about their mistakes. Changing your students' perspective on mistakes is the greatest gift you can give yourself as a teacher. Imagine having a classroom of students who are engaged and constantly improving -- it's every teacher's dream. Instead, teachers face too many students who are disengaged and really rather surly. That surliness is years in the making. By the time students walk into your classroom, they've likely already internalized their mistakes as evidence that they're just not smart. Getting a bad grade feels like a personal attack. No wonder they're giving the deliverer of those grades the stink eye. To help your students rethink mistakes, help them be specific about their errors. Knowing that answer #3 is wrong doesn't mean much. Knowing that they didn't understand mitosis gives them a mandate for getting better. Often, when we go through tests with students, the mistakes they perceive as dire are either careless errors or a single concept applied incorrectly on several questions. Either way, the "fix" is usually smaller than how big the problem feels. You can also help students view their mistakes as helpful. 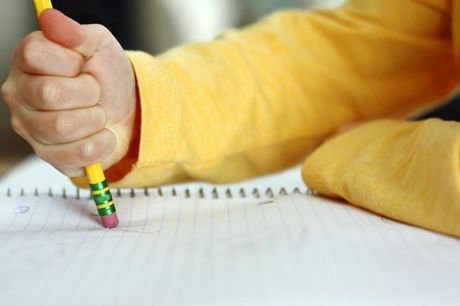 The red pen isn't the enemy -- when students understand how to deal with errors, red means go. One way to encourage that attitude is to take the most common mistakes that the class made on a test or quiz and analyze them together. The more open everyone is about the mistakes they've made and how they happened, the less significance any student will place on future errors. Mistakes happen for concrete reasons. A student didn't memorize all the requisite facts, didn't execute the steps of a process, or perhaps just ignored the directions. The red "X" is just a simple assessment of the actions that student took -- actions he or she can easily fix next time. Sharing that clarity and causality with your students is the best way to teach deliberate practice, instill motivation and help them develop a more constructive relationship with mistakes. In short, this creates the class you and your students have always wanted.